12 Company founded(as Japan Synthetic Rubber Co., Ltd.)in accordance with the Special Measures Law for the Synthetic Rubber Manufacturing industry. 4 Yokkaichi Plant began production and sales of butadiene,SBR,and SB latex lines.Osaka Branch was Opened. 6 The Nagoya Branch was opened. Sales of High-styrene latex began. 7 Sales of paper coating latex (PCL) began. 10 JSR advanced into the field of synthetic resins and production of ABS resin began within the Yokkaichi Plant. 11 Sales of NBR began. 2 Sales of BR began. 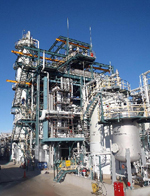 4 The Chiba Plant was completed, and production of butadiene began. 7 The European Office was opened. 3 Sales of IIR began. 4 Changed company's status to private owned. 9 Sales of EP began. 1 The Kashima Plant was completed, and production of butadiene and SBR began. 12 Sales of IR began. 6 Sales of RB began. 4 Sales of acrylic emulsion began. 4 Sales of CIR (negative type photoresist) began. JSR advanced into the semiconductor materials business. 4 Sales of AES resin began. 7 With the commencement of sales in IMMUTEX (uniform latex for clinical dianosis), JSR advanced into the life sciences field. 5 Importation and sales of optical fiber coating materials began. 11 Sales of PFR (positive type photoresist) began. 5 Sales of DESOLITE (optical fiber coating materials), resin began. Mighty Series (structural adhesive) began. 5 Sales of SIS (Styrene Isoprene block Copolymer) began. 3 Sales of OPTMER AL (Alignment films for LCDs) and OPTMER SS (protective coatings for LCDs) began. 4 Two-day weekends and flexible working hours were introduced to the entire company. Under cooperative development with Sony Corp., the Solid Creation System, which makes 3D plastic models by using lasers and computers was developed, and sales began. 5 Tsukuba Research Laboratory was officially opened. 10 Japan's first plant specializing in TR(thermoplastic elastomer) production, SHELL JSR ELASTOMERS K.K.was completed within the Kashima Plant. 11 Sales began on newly developed PCRs and ICs inspection systems. 2 Concerning photoresists for Europe and North America, a joint venture contract was signed with UCB S.A. (Belgium). 10 Sales of DYNAFLOW began. 1 Childcare leave and healthcare leave systems were introduced. 5 DYNARON (hydrogenated polymer) and DYNARON ALLOY (the thermoplastic elastomer using this polymer) were developed, and sales began. 1 New research building was completed within the Yokkaichi Plant. 7 UCB-JSR Electronics S.A. (Belgium) became wholly-owned subsidiary of JSR, and restarted by being renamed JSR ELECTRONICS N.V. Simultaneously JSR MICROELECTRONICS,INC. acquired U.S. operation as their subsidiary. 2 ISO9002 certification were obtained for synthetic resin and NBR of the Yokkaichi Plant. 12 The Shanghai Office was opened. Sales of OPTMER CR (color pigment dispersed resists for LCDs color filters) began. In order to conduct local production of CMB, capital investment was made in PI INDUSTRY LTD.(Thailand). 7 The Seoul Office was opened. 9 ISO9002 certification was obtained for the semiconductor, display, and edge computing materials of the Yokkaichi Plant. 11 A high transfer blow molding technology (J-Blow) which gives excellent appearances equivalent to injection molding was developed. 7 The ABS resin business was integrated with that of the Mitsubishi Chemical Corp., and a joint venture company, Techno Polymer Co., Ltd. was established. 3 Construction work was completed for photoresist plant of JSR MICROELECTRONICS, INC.
9 ARTON™ mass-production plant was completed within the Chiba Plant. 10 The Taiwan Office was opened. Completed a photoresist production plant of JSR Electronics Kyushu Co., Ltd.
11 The Singapore Office was opened. ARTON Process Research Laboratory was officially opened. 12 Changed of corporate name to "JSR Corporation." 3 ISO14001 certification was obtained for the Yokkaichi Plant. 2 Photosensitive spacers and other LCD Materials launched in a new high-performance product range to create LCD panels of higher contrast and precision. A new mainstay information system was constructed and put into full information from April 1 st to unify the management of informantion on sales, operation, accounts, personnel and all other aspects of business astivity. High-performance ;olishing slurries (the CMS series) launched for full-scale sales. 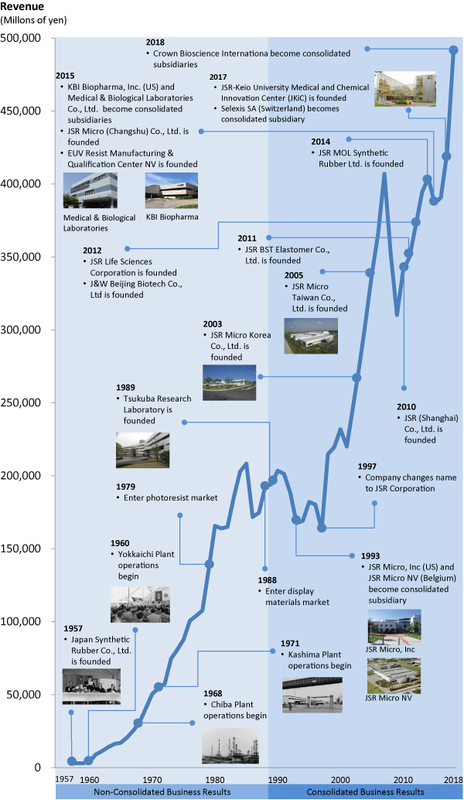 JSR Microelectronics (US) became the first japanese-affiliated resistar manufacturer to begin production of excimer laser photoresist outside Japan. ISO14001 certification was obtained for the Chiba Plant. 5 ISO14001 certification was obtained for the Kashima Plant. 3 A new masterbatch company ELASTOMIX (THAILAND) CO., LTD. was established in Thailand. 4 IMEC (Inter-unibersity Micro Electronics Center) selected JSR ArF resist for 130nm devices. 3 New plant start to produce coating materials, Desolite, for optical fiber. JSR realize Dual Production Sites. 10 Launch of "JSR EXCELINK," new sophisticated olefin-based thermoplastic elastomer. 10 JSR Electronics Kyushu Co., Ltd., JSR Microelectronics, Inc. and JSR ELECTRONICS N.V. changed their names to "JSR Micro Kyushu Co., Ltd.," "JSR Micro,Inc." and "JSR Micro N.V." accordingly. Begins production of emulsion polymerization SBR consigned by Sumitomo Chemical Co., Ltd. Posts personnel dedicated to the electronic materials business in the Shanghai representative office to strengthen this business area in China. 11 Completes new plant facilities for semiconductor materials in Belgium. 12 Completes new plant facilities for CMP polishing pads in the Yokkaichi Plant. 5 Relocates the Head Office to HAMARIKYU Parkside Place, 6-10 Tsukiji5-chome, Chuo-ku, Tokyo, Japan. 12 Production plant of ARTON film for optical use was completed on the Yokkaichi Plant premise. 1 Stock trading unit reduced from 1,000 to 100 shares. 4 JSR group company "NICHIGO SHOJI CO.,LTD." changed name to "JSR Trading Co., Ltd.". 5 Constructed JSR Micro,Inc.,the application laboratory of CMP for semiconductor manufacture. 6 Achieved "zero waste" at all plants as a first for the petrochemical industry. 7 JSR group company "Nichigo Engineering Co., Ltd." changed name to "JSR ENGINEERING CO., LTD.". 10 JSR Micro Korea Co., Ltd (plant for production of LCD Materials) was completed and started commercial production. 12 Succeeded as the first company in the world to achieve a resolution of 32 nm through ArF Immersion Lithography. 4 JSR has developed photocatalytic coating materials with super long-term durability making use of organic/inorganic hybrid technology, and has launched it as a new product in the DYNACERA lineup. 8 Completed the 2nd phase construction of the production plant for display materials (JSR Micro Korea Co., Ltd) in South Korea, and full operations began. 11 Increased production capacity for SSBR (Solution Polymerized SBR). 1 Completed the construction of new clean room facilities at the Yokkaichi research center. 2 Together with IBM, JSR has further advanced the viability of immersion lithography by demonstrating sub-30nm patterning with ArF lithography systems. 3 Completed construction of precision machining pilot facilities at the Yokkaichi plant. 7 JSR Micro Taiwan Co., Ltd. (plant for production of LCD materials) was completed and started commercial production. 10 Received the Best Supplier Award for ArF resist for the next generation memory from Samsung Electronics. Launched the Campaign of the Corporate Slogan,"With chemistry,we can." Received Japan Industrial Techniques Grand Prix. Completes "Kinki University Molecular Engineering Institute,JSR Functional Material Research Center." 5 JSR received "FY2006 The Society of Polymer Science, Japan Prize" for developing fuel cell electrolyte membrane film. 8 Established "JM Energy Corporation" for lithium ion capacitor businesses. 12 Completes of the Precision Process Research Laboratories in the Yokkaichi district. JSR and IBM concluded a joint-development agreement to R&D next generation semiconductor processes. 3 Introduce the "Career Redevelopment System" to re-employ former employees who left the company such as to raise children, nurse family members. 9 Singapore office was opened. 11 JM Energy Completed construction of world's first commercial production plant of lithium ion capacitors. 1 Relocates the Head office to Shiodome Sumitomo Bldg., 1-9-2 Higashi- Shimbashi, Minato-ku, Tokyo. 3 Joint-venture Techno Polymer Co., Ltd. becomes 100% subsidiary. 4 Installation of a large-scale, natural gas-fired turbine cogeneration system at the Yokkaichi Plant. 10 "With chemistry, we can. ", the history book of JSR’s first 50 years, was awarded by Japan Business History Institute. Launching new, highly tough Polylactic acid-based bioplastic:"BIOLLOYTM"
Announcement of Termination of the Capacity Rights Agreement of SSBR with Styron Europe GmbH. 4 JSR receives Supplier Continuous Quality Improvement (SCQI) Award from Intel Corporation. 6 CMIC and JSR established a joint venture, CMIC JSR Biologics Co., Ltd., for the Development of Next-Generation Antibodies. 10 JSR established a joint venture, JSR Electronic Materials Korea Co., Ltd., for electronic materials business in Korea. JSR Receives Supplier Continuous Quality Improvement (SCQI) Award from Intel Corporation. JSR reached agreement with Keio University to jointly establish and operate the JSR/Keio University Medical and Chemical Innovation Center, a joint research institute to be positioned as a base for industry-academia-medicine cooperation. 6 D-MEC Ltd. begins to sell a stereolithography 3-D printer that achieves the largest-size reproduction in Japan. 10 MBL becomes a consolidated subsidiary of JSR. 2 JSR and imec establishes a new company “EUV Resist Manufacturing and Qualification Center N.V.” for the production and qualification of EUV resist. 3 JSR Receives Supplier Continuous Quality Improvement (SCQI) Award from Intel Corporation. JSR is selected for the FY 2015 Nadeshiko Brands by the Ministry of Economy, Trade and Industry and the Tokyo Stock Exchange. 5 Reached a basic agreement with UBE Industries and Mitsubishi Rayon Co., Ltd. (Mitsubishi Chemical Corporation) to start a negotiation for the merger of subsidiaries in the ABS resin business. 8 Developed a 3D printed prosthetic Leg with ANA and SHC Design. 9 Strategic investment in US startup with innovative 3D printing technology. 10 ELASTOMIX Co., Ltd. decided to establish a new carbon masterbatch company in Mexico. 2 JSR is selected for the the 2017 Certified Health & Productivity Management Outstanding Organizations Recognition Program ～White 500～ by the Ministry of Economy and the Nippon Kenko Kaigi. 3 EUV resist manufacturing facility completed at EUV Resist Manufacturing & Qualification Center N.V. (Belgium). Received Intel’s Prestigious Supplier Continuous Quality Improvement Award. JSR is selected for the FY 2016 Nadeshiko Brands by the Ministry of Economy, Trade and Industry and the Tokyo Stock Exchange. Corporate Logo of JSR Corp.